So how do you squash yours? Cartons not kids! It's half-term week here in Suffolk, so what a perfect opportunity to not only indulge in the great outdoors but also to engage the kids in a bit of amateur dramatics for Tetra Pak's How do you squash yours? competition, which is encouraging consumers to flatten cartons before recycling them. There were a few tantrums and tears, which led to a full-blown rugby tackle after I turned off the camera. My younger boy was calling for a rematch! The video is now published but before you check it out below, let me reassure you that no children were harmed during or after the event ... except for my eldest accidentally falling into a blackberry bramble. Boys will be boys....bless 'em. They were great sports really and told me they actually did have a good time. More information about Tetra Pak's YouTube competition can be found on the company's website, along with the latest news that the cartons are now also FSC (Forest Stewardship Council) certified. Don't forget, if you'd like an opportunity to join in the competition, you have until 1st November to enter. I'd like to thank Daniel over at online news site Newsy.com for making a surprise appearance in my inbox yesterday, pointing me in the direction of the website's encouraging report on the adoption of Zero Waste projects worldwide. This is the first time I've come across Newsy and I know I am biased in relation to the content matter, but I happen to like the nature of its reporting and how it gives an international perspective on this subject. Hot on the heels of recent news about local Zero Waste projects in the UK, such as our Seven Streets project in Suffolk, it is really inspirational to see how other communities and overseas organisations are also tackling their own waste mountains. "When you reduce waste, you're taking inefficiencies out of the system, which ultimately means you can lower prices." This is the language of commerce, using incentives that developers, manufacturers and retailers hold dear. And interestingly, bringing it back to a local perspective it was this strong argument that was also used in a presentation that I attended this week about Resource Efficiency, which was aimed at small and medium sized businesses. So it looks like the old adage "Necessity is the mother of invention" is actually coming true, just as the report illustrates with its news of waste management developments and commitments from retailers. The path to Zero Waste really does feel like a new and exciting industrial revolution and the great thing is it looks like it is truly international. I now can't wait to see what happens next. So see what you think of the Newsy report below. And if you're reading this in an RSS feed here's the link to connect directly to the video on the Newsy website. Amanda Holden and Oliver Heath are at it too! Slimming people's bins of course...what else could I possibly mean! Looks like zero waste could hit the nation's streets, with the help of Kenco's latest marketing strategy for their eco-refills waste-less campaign. So check out the video below to see what TV presenter Amanda Holden and eco-designer Oliver Heath are getting up to in Waste Lane, "Up North" in Yorkshire. If it's really successful, perhaps it should be renamed Zero Waste Lane. Fingers crossed eh! Oh, I almost forgot in my excitement, if you click through to www.kenco.co.uk, there is even a chance to win an eco-break. You'll also see that if you send your empty packs back to Kenco, they will be upcycled by the wonderful Terracycle AND Kenco will give money to your favourite charity too. Now that can't be bad. This Wednesday is Apple Day, an annual event that has been organised by the charity Common Ground to celebrate apples, orchards and local distinctiveness. There are many ways to celebrate the big day, with events taking place all over the country, including invitations to participate in the Longest Peel competition. Would you believe the record for the longest unbroken piece of apple peel is 52.51m long. I won't be challenging the record, but I have to admit that apples are one of my favourite fruit, not least because they are inexpensive but also because they are so versatile. Not only are they delicious eaten fresh from the tree but are also flavoursome when added to desserts or even soups. For me, they really do represent the taste of autumn and I've already found a lovely list of Suffolk varieties which I hope to start researching soon. The Suffolk Pink comes highly recommended, thanks to my recent taste tests. My personal plans for celebrating this year's Apple Day is to bake an "Apple cut-and-come-again Cake" which can be found in the fabulous Grown in Britain Cookbook. It really is delicious on its own as a snack or served up with custard. It also kills two birds with one stone, as this week is National Baking Week too. However, if you're not up for a bit of baking, you can still get involved in celebrating Apple Day. You could follow the advice of Monty Don and the Gardeners World team and plant an apple tree in your garden or school. Or you might like to show your support for Community Orchards by saving old ones or planting new. If you're keen to help reduce waste, why not follow the example of Suffolk's "Share-an-apple" volunteers and ask local apple growers\gardeners if you can scrump their spare produce to share with good causes. And if you've got some apples spare yourself, you could try creating your own unpackaged dried fruit. Mrs Green over at MyZeroWaste has got some great advice on a whole variety of methods you could use. There's lots you can do to celebrate the great British apple, so if you get a chance, please pop over to the Apple Day website for more info. Once upon a time, talking about Christmas in October used to be far too unseasonal for me, especially thanks to weeks of pent-up frustration of seeing festive cards and giftsets appearing in shops months before the celebration itself. But this year, I'm of the opinion that if I can't beat 'em, I'm most definitely going to join 'em and start getting ready for Christmas too. I know we haven't even enjoyed Halloween yet, but I've got certain plans that need a little more time than traipsing around the high street can offer, which is why I'm getting prepared now. Yes, this year I've set myself a challenge of organising christmas gifts which come with that extra personal touch and apart from a couple of things the children would like, most of the presents will be made by me or by local artisans and producers. Without giving too much away, on account that some recipients may be looking in and due to the fact that I haven't yet got a precise plan of action, I am hoping to make Christmas preparations as simple as possible. I've been harvesting runner bean seeds from the garden which I can give to some of my more green-fingered friends. I'm also going to make some festive pot-pourri, made from dried citrus peel, fir cones and rose petals. I'll be on the look out for some cinammon sticks to add to the blend too. I've never done this before so watch this space to see what happens. My children absolutely love money, so I have been busy gathering all our loose change and filling up jam-jars. 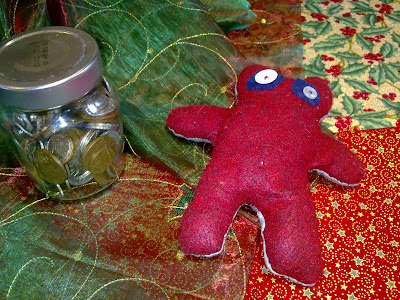 I'm planning to add chocolate coins to the collection to create mini treasure troves as stocking fillers. And talking of stocking fillers, would you believe that I've had a special request to make more of the little stocking fellas I created last year. This year I will also be ditching traditional gift-wrap and will instead spread the joy of reusable fabric wrapping, so I have treated myself to a few metres of gorgeous fabric decorated with festive prints. Don't fall off your chairs but I'm planning on calling the sewing machine into action to make some present bags. So it looks as though this year will most definitely be a year of recycling and reusing, as well as using up stuff that we've got around the house. I'd love to know your ideas too. With little time on my hands as ever, I'm up for all ideas that come my way. If you're a blogger you may even be interested in joining in the Thrifty Christmas carnival which will be hosted by the lovely Liz over at Violet Posy. You can find more info about it here. Given that the run-up to Christmas time has been very stressful indeed in previous years, this year, I am feeling surprisingly calm. Despite having more to do, I am optimistic that I will really enjoy it for the first time in ages. Well that's the plan. All I now hope... is that the recipients will enjoy their gifts too. There's no getting away from it, Climate Change is such a serious subject. So it's refreshing when a wriggly little thing with three eyes pops up to remind us of the small things that count and how these little things make a huge difference. This positive creature is called the Green Thing. If you haven't met it yet, perhaps it's time to say hello, especially as it's Blog Action Day and bloggers all over the world are encouraging people to stop and think about how we tackle climate change. So without further ado,I invite you to click on the video below and shake the Green Thing by one of its many tentacles. Just be careful it doesn't tickle you though especially when you're least expecting. 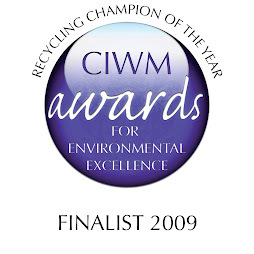 It's reached the final of this year's Green Awards and it could get rather excited. Meet Green Thing from Green Thing on Vimeo. 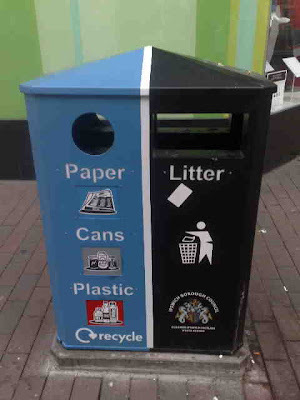 On-street recycling bin in Ipswich, Suffolk. Things are most definitely hotting up in the UK, with Hilary Benn, the Secretary of State for the Environment today announcing plans to turn Britain into a "Zero Waste Nation", expecting all local authorities to offer comprehensive collection services by 2020. Included in his strategy is a ban on recyclable materials from landfill and schemes to encourage better recycling, including the generation of energy from collected food waste. As well as municipal waste, there are also plans to reduce commercial and industrial waste, working with businesses and the waste management industry to encourage innovative practices. This is great news in itself, but what excites me more in a "Football's coming home" kind of way, is that my local county of Suffolk, in the East of England, has been chosen as one of six new Zero Waste places to trial what many are calling the government's tough new recycling policy. Representing the Suffolk Waste Partnership, Councillor Roy Barker, has this evening been quoted in the local press, saying he is delighted that Suffolk is at the forefront of this innovative scheme. And I can certainly share his enthusiasm, especially as it has been confirmed that Suffolk residents are already among the best recyclers in the country, with half of our waste being diverted from landfill. So where can Suffolk go next in its Zero Waste plans? Well, the exciting news is the announcement of the "Suffolk Seven Streets" project, which has been awarded a £10,000 grant from DEFRA, challenging local households to reduce their rubbish even further, indeed by half. One street in each of the seven Suffolk local authority districts will be selected to test a new recycling regime. And with the support of council recycling teams, businesses and residents will be encouraged to see who can reduce their rubbish the most. Further news will be available over the next few months as the local scheme takes shape and I can't wait to report on what's happening in and around the county. But dare I say, as well as encouraging others, the competitive streak is now rising within me and I am already dancing around in glee flying my own virtual flag for St Edmundsbury. I'm now wondering if I can volunteer my own street and survey our local residents to see if they want to fly the flag with me. I think I might just ring the council and see if we're eligible. But then again, the thought of knocking on strangers' doors makes me feel like the BBC's choirmaster Gareth Malone trying to create a brand-new community choir in South Oxhey. I suppose I could always don an England football shirt, and merrily sing "Recycling's coming home" when they answer. Or should it be an Ipswich Town shirt I wonder. One thing's for sure, if the "Suffolk Seven Streets" project gets as competitive as the local football leagues, just imagine the results. I won't run ahead of myself quite yet. All I can say is well done to Suffolk County Council and the Suffolk Waste Partnership. Congratulations on taking the lead. When it comes to Zero Waste projects, this is going to be very exciting indeed. I'd just like to give a huge shout-out to the Recycling Officers at East Devon District Council, who are kicking off their Zero Waste Week today. The council is in the process of introducing weekly food waste collections and to raise awareness of new methods available to reduce landfill, they are giving residents who already benefit from the new service the opportunity to participate in their first Zero Waste week. Contestants will need to go for one week without producing any black bag rubbish and there will be a prize for the most successful household. Although the competition is open to residents on Monday and Tuesday collections in the Axe Valley, Sidmouth and Ottery areas, other folk in the district are being encouraged to participate by avoiding packaging and recycling or reusing everything they can. And if you have been listening in to Good Morning Devon today, you may even have heard East Devon's Waste Management Team's Steve Joyce making his radio debut with his colleague Naomi. It was all fun and frolics with BBC Radio Devon presenter Matt Woodley, inviting Steve and Naomi to delve into his family's binbags to find out what could be done with a "fetching pair of plum hotpants"and a pink bra. Steve's tip that the bra could actually be recycled and might even come back as soundproofing material certainly caught the attention of the radio presenter as well as other interesting facts during the 10 minute slot. Having your rubbish waded through on air, is a brave thing to do even for a confident radio presenter, but it did make great listening as Naomi and Steve managed to reduce the rubbish by 50%. So if you live in Devon and missed the debate, which included top tips about nappies, dry cleaners' bags and shredded paper, then it's worth popping along to BBC Radio Devon and clicking on the Listen Again button. You just need to fast forward to 2hrs 32 minutes. Best of luck to all in East Devon who are taking part and to Steve and Naomi in their bid to help reduce the UK's landfill. It's wonderful to see more councils rolling out Zero Waste challenges and when the week is over, I'll be sure to report back on their successes. And if you'd like to find out more information about East Devon's Zero Waste Challenge, further details can be found on the council's website. It's 10:10 - Happy Anniversary Mr A. "We're not swapping presents this year are we?" asked Mr A attempting to settle his nerves over whether he needed to buy me a gift for our wedding anniversary, which happens to be today. Well, it's always worth checking your wife's expectations don't you think! He's a very wise husband indeed. Anyway, to cut a long story short (which I know is a rarity around these parts), I declined the offer of a pressie on account of having enough sparkly things, lingerie and champagne to last me for a while longer . And besides he's already "treated me" to my very first pair of reading glasses this week. And that wasn't cheap, neither was his loving acceptance that his old bird had finally reached "that age". But don't worry, romance isn't quite dead yet - despite the ageing process kicking in - because yesterday I had a momentous brainwave and rang him to break the news. "You know I said I didn't want anything for our anniversary" I mumbled, interrupting him during his lunchbreak. "Yes?" he replied, in more of a questioning tone rather than one of confirmation. "Well, I've changed my mind" I added, then proceeded to ramble on about how I'd like to make a small donation to 10:10, the organisation that is working its socks off to inspire individuals, businesses and public organisations to reduce their carbon emissions by 10% in 2010. 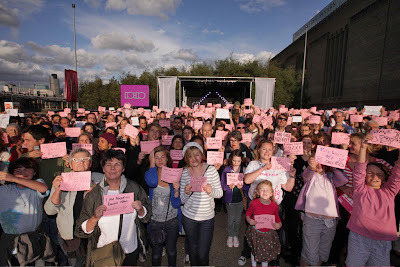 Here are just a few of their supporters, lots of other ordinary folk down at the launch party in the summer. 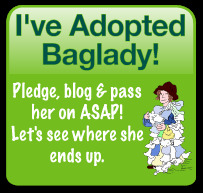 "That's how I'd like to celebrate our anniversary, by pledging to commit to our future." I said. Then came the silence. Surely that was what marriage was about anyway. The donation may have seemed a random suggestion - just like the day he returned home from work earlier this month to my announcement that I'm to become a poppy seller. It has all probably left him wondering if I'm the same old girl that he married 11 years ago. Indeed I often wonder if I am indeed the same lass who you can see in the photo below. But before I knew it, he'd agreed to my anniversary wish and a cheque is now winging its way to help produce supporter packs for people who want to raise awareness in their local communities. But it's not just about donating money. It's also about taking action too. And I've been pondering this a lot over the last few weeks. Okay, I know we've been doing our bit and reducing our carbon footprint quite significantly as far as recycling and reducing waste go, but I've wondered what else I can do and it's all becoming blindingly obvious, dare I say. Now it might sound very 20th Century and 1950s housewife-ish, but I'm beginning to think it all revolves looking after my husband a lot better than I've been doing for the last few years or so. Take this week, when he gently suggested that he should perhaps take home-made lunches to work...instead of partaking in the 8 mile round trip into town, or dropping into the nearest supermarket! Yes, I know... I've never been efficient in that particular area. Then there's the issue of organising our kitchen, so I can make better use of the little storage we have and minimise the shopping trips that I have to make. And of course, there's the perennial issue of the growing pile of pants. If I wasn't such a hapless case of a housewife, I might just keep on top of the washing pile, which means he'd never again have to make an emergency trip to Marks and Spencer for a critical top up. These are just some small changes that can make a huge difference. 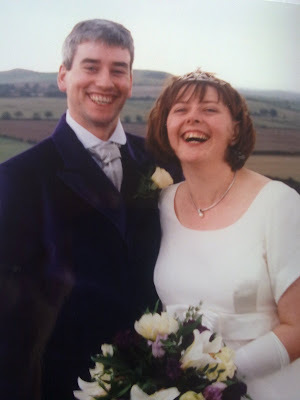 So, I've a funny old feeling that today I may be renewing our marriage vows, which will go someway beyond for richer or poorer or in sickness and in health. It looks like I'm going to need an organisational overhaul. Of course, if I'm going to do my bit for saving energy it will mean turning down the lights tonight and digging out the tea lights instead. I just need to find something to put them in. Perhaps I could use some of those jam jars that I have been collecting for I don't know what? The problem is, where the blimmin' 'eck did I put them? Oh well, it looks like it's back to the kitchen for me for a good rummage in my disorganised cupboards...and while I'm there, I'll remember to wash those blimmin' pants. I'm still here, but I'm also over there too! Here's a big hello from the East of England. I'm sorry if I've been a bit quiet on the blog recently. As well as celebrating the news of last week, I've also been busy looking after a poorly little boy and preparing for a bigger boy's 8th birthday [geez, he was just six when I started the blog]. And while all this has been happening I've also been getting around making a few guest appearances elsewhere on the old Interweb. So any guesses, where I've been hanging out? Well at the weekend, we popped over to the Aldeburgh Food & Drink Festival, which was a great event. I'm hoping to blog about it soon, but in the meantime I've put some photos up on my Twitpic Account. I've also been talking rubbish over at MyZeroWaste , helping Mrs Green out with a guest post and being loud and proud about community action. She's got some other articles from other familiar faces, so do go and have an explore. And elsewhere, I've been interviewed by Willi Paul over at PlanetShifter, answering some very deep questions about all sorts of things to do with recycling and sustainability. And yes it did make my head hurt on times. So after all that, I think I need to put my feet up before my 8-year-old gets home desperate to tuck into the birthday cake. Well it will be when I've made it! It's at times like this I really wish I could be in two places at the same time.